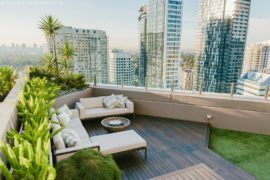 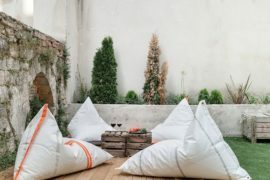 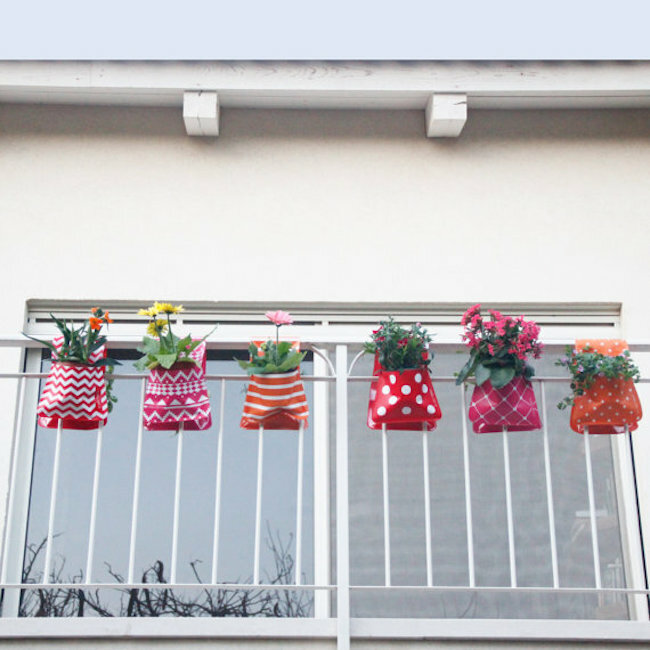 If you live in an apartment and are blessed enough to have a balcony that comes with it too, you’ve probably given at least some thought to how you can go about making what little outdoor space you have as functional and as appealing to the eye as you can. 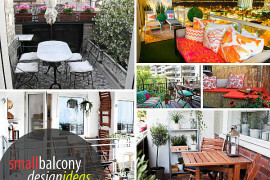 That can be really hard when you have lots of ideas that involve bringing big, bulky furniture pieces and accessories to a balcony that just doesn’t have the room for it. 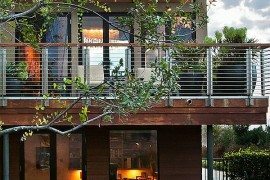 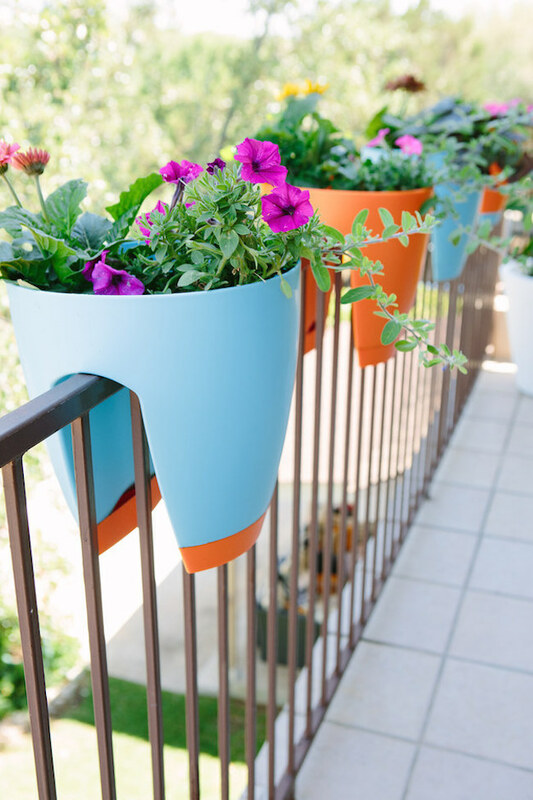 While you may not be able to fit a full-sized patio set or a large collection of planters out there, you can scale some of those ideas down a bit with some of the really inventive balcony railing solutions below. 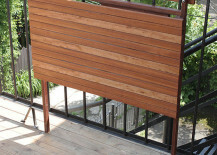 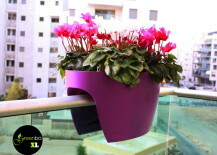 Rather than lining up a bunch of planters on the floor of your balcony, try hanging them from your railing instead! 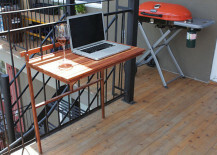 You can save precious floor space this way and avoid tripping over anything. 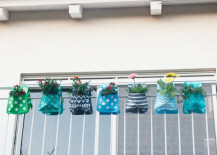 FloraPockets on Etsy sells these adorable little planter pockets in all sorts of colors and patterns. 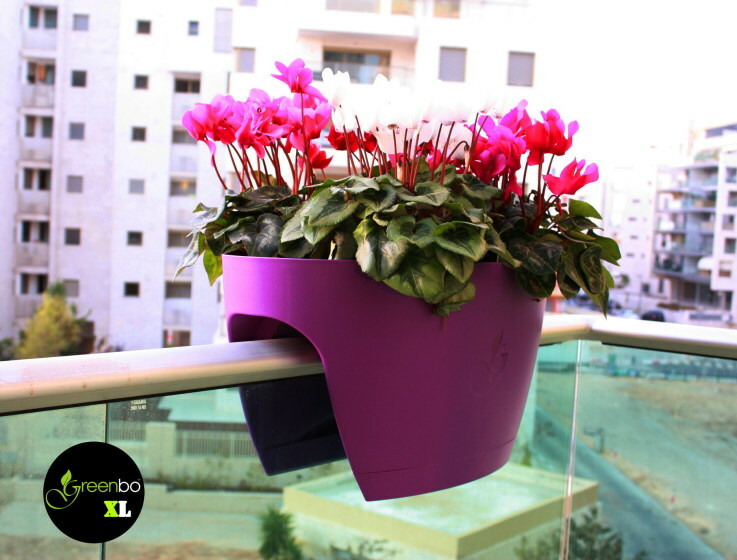 You could probably even use them to grow herbs too! 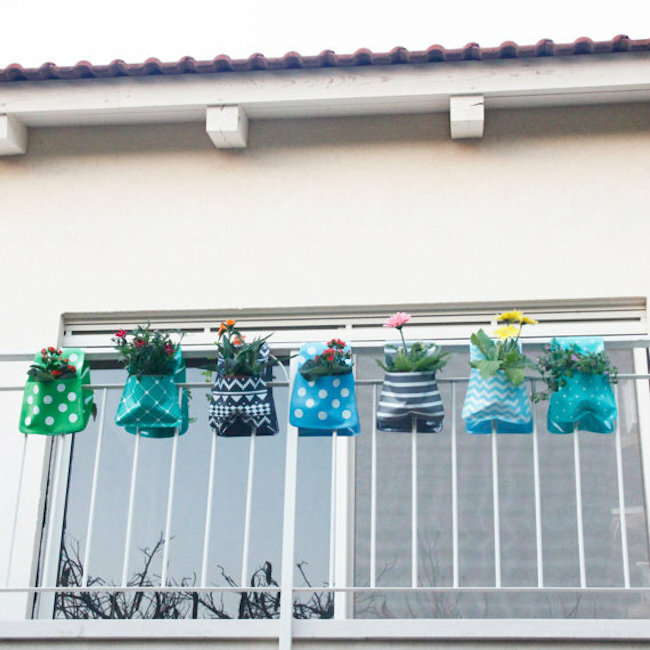 Those flower pockets sure are cute, but if you still prefer the look of a traditional planter or pot, you can purchase items that are designed to sit on the railing of your balcony. 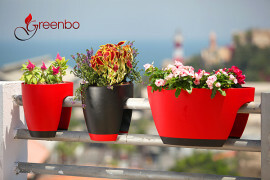 Greenbo planters from Home Depot maintain that classic potted shape, and come in all sorts of great colors. 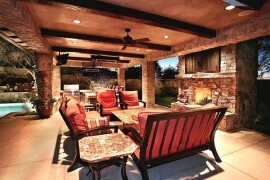 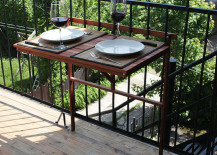 It can be a real struggle to find a small enough patio set or table that doesn’t make a balcony look too cramped. 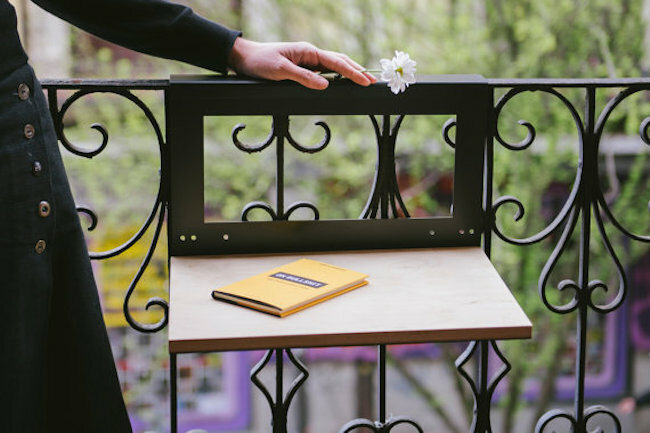 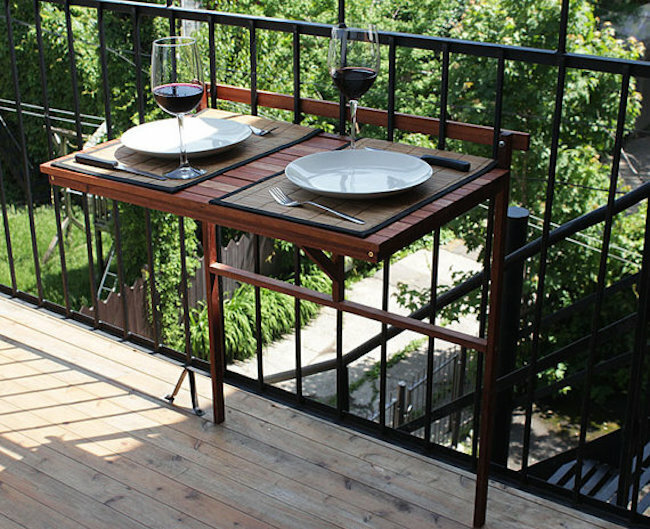 If a regular patio set is out of the question, you could try this nifty foldable table from Singulierlampandcab that conveniently attaches to your balcony railing. 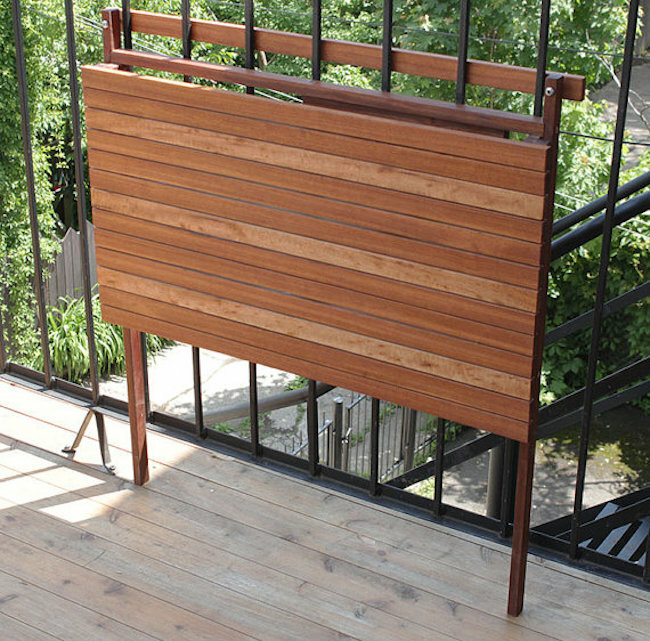 When you’re not using it, it folds down flat to maximize space. 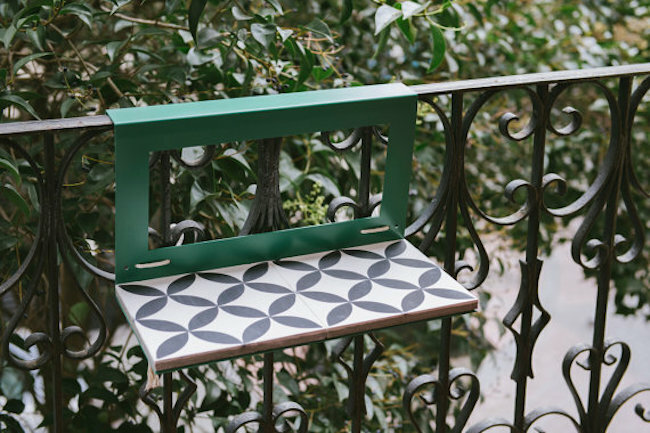 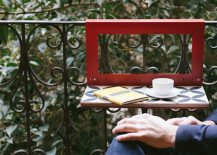 If you don’t plan on dining or working out on your balcony, but still could use some extra flat space to place a book or a cup of coffee or something, you have to check out the gorgeous Madrid balcony-inspired Manuela table from NIMIO on Etsy. 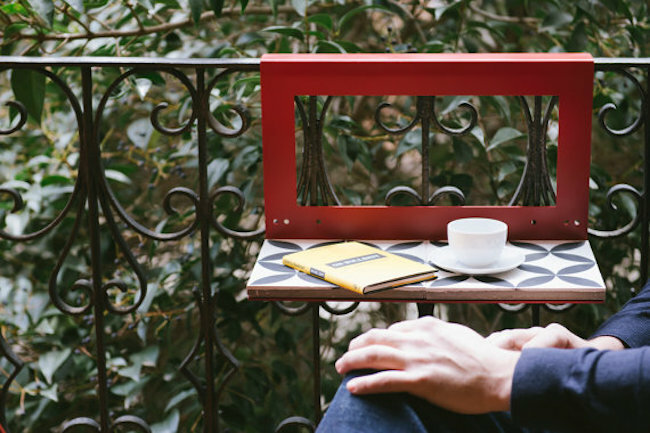 Although it’s ultra tiny, you’ve got to admit it’s also quite elegant and stylish — especially with all the different colors and patterns it’s available in. 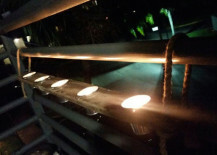 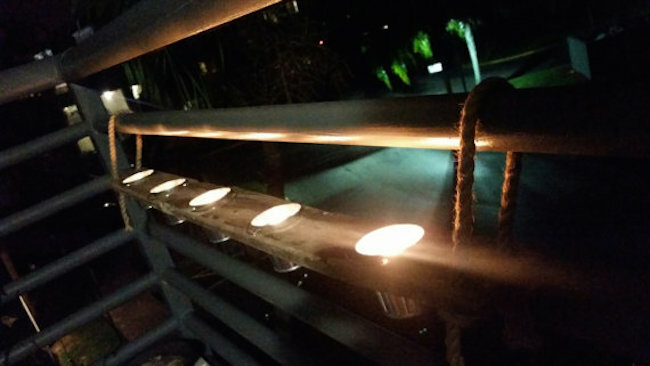 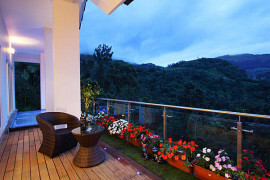 You can turn any old balcony into a calm or romantic outdoor space by adding a bit of candle mood lighting. 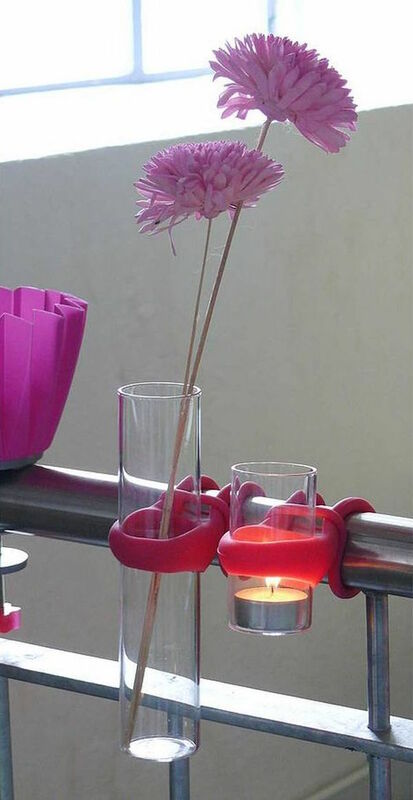 But that’s easier said than done when you have no place to put them! 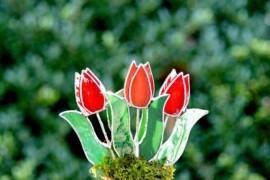 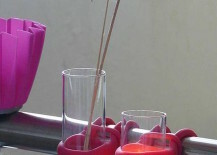 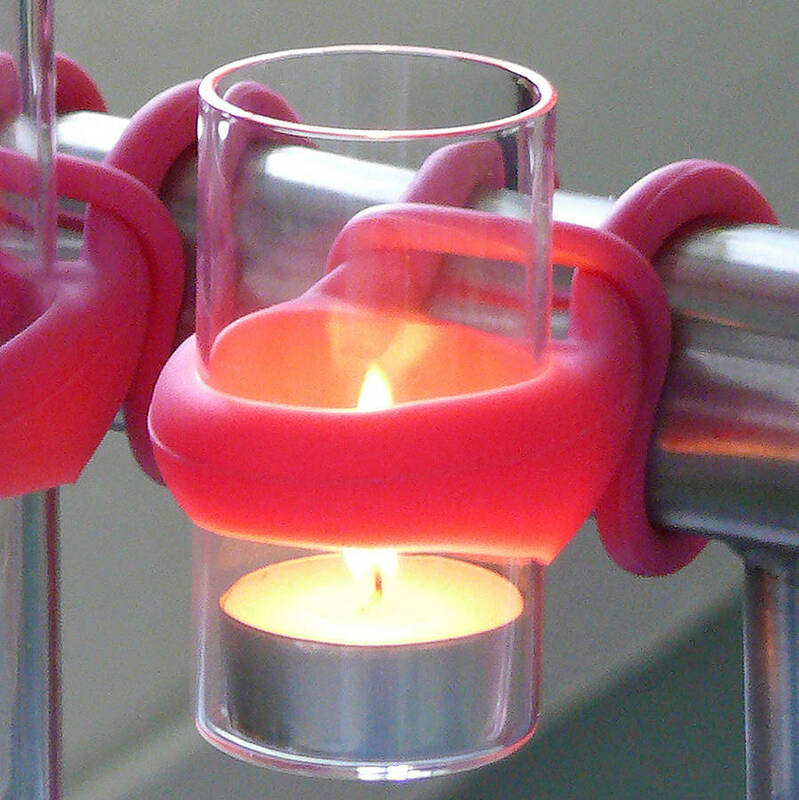 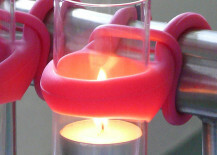 Not on the High Street sells these funky looking glass candle holders in all sorts of different sizes and colors too, which you can conveniently secure to your railing. 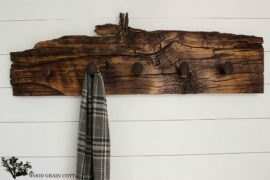 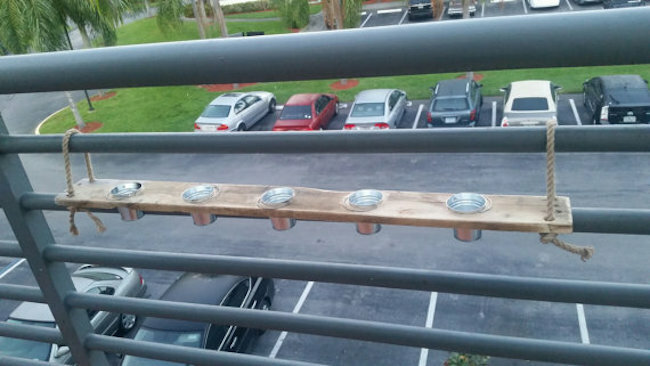 If funky isn’t quite your style, you can also get something like this pallet wood balcony tea light holder from Reclaimed2Creations for a simpler, more rustic look. 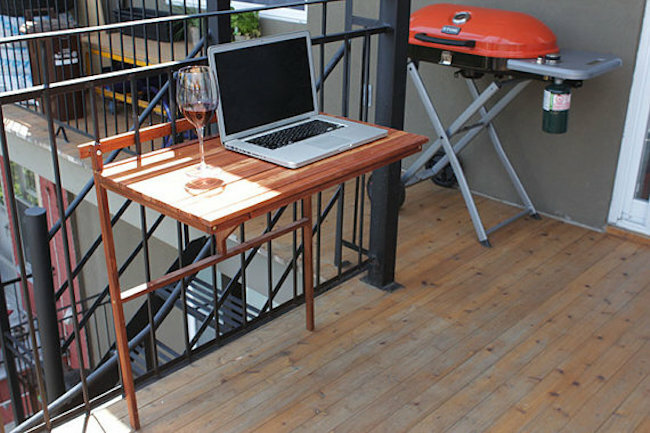 If you thought that having a barbecue at your apartment was impossible, think again! 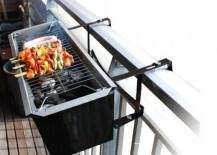 This little grill that you can attach to the railing is compact and convenient enough for almost any balcony. 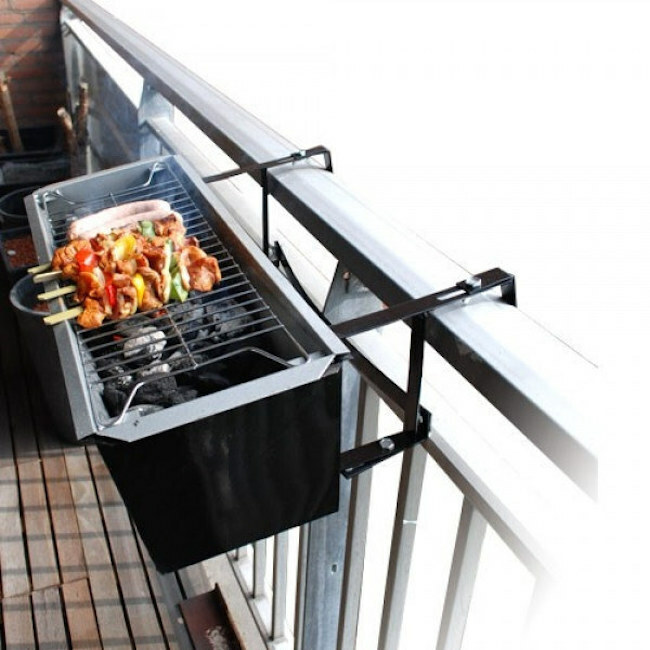 This one is sold out for now on Urban Outfitters, but if you look hard enough you could probably find other types of grills similar to it.